Western Container Corporation - We're Wound-up to serve you! Kraft paper is strong paperboard material that is highly resistant to tears. 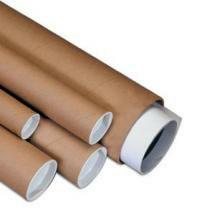 At Western Container, we use kraft paper to manufacture our kraft mailing tubes. These tubes are an excellent solution for your business’s mailing needs. The tubes come in a variety of dimensions that can be specified based on their intended use. When you are mailing documents or other important items, a kraft paper tube is the perfect way to protect the contents as they are being transported and prevent damage that could affect the value of your goods. If you are looking for promotional kraft tubes, we can add one color custom printing to your order so that your kraft mailing tubes display your company’s logo or message to the recipient. Kraft mailing tubes from Western Container can also be purchased with plastic end caps for added strength and security. Our smallest kraft tubes have dimensions of 1” x 6” (W x L), while our largest kraft tubes are 12” x 48” and longer. Order kraft mailing tubes from Western Container today and you’ll see for yourself the difference that quality makes when you are mailing important documents and other items. We even stock heavy duty kraft tubes with thicker walls for special uses where added strength is necessary. Western Containers is a leading kraft tube manufacturer, so you can trust us to provide you with the best kraft mailing tubes for your business! Kraft mailing tubes are just one of the many quality products that Western Container manufactures and sells. We also offer a wide range of cardboard cores, strapping cores, paper tubes and much more. We can even supply you with packaging supplies to keep your shipping and receiving department running smoothly. If you don’t see exactly what you are looking for in our product listings, contact us and find out if we can manufacture a custom container for you! Located in a state-of-the-art manufacturing facility in Beloit, Wisconsin, Western Container Corporation manufactures and supplies spiral wound paper tubes and precision cores to customers both nationally and internationally. We maintain close relationships with the world’s leading paper tube equipment designers so that we can always be at the forefront of our industry’s innovation and technology. Western Container can provide you with superior design, quality and pricing. We believe that offering great service to our customers is at the core of what makes us such a successful container manufacturing business. We always go above and beyond to meet the needs of our customers, no matter how unique they may be. If a customer comes to us looking for a solution that they can’t find anywhere else, we’ll design it for them and provide them with something that matches their specifications. As part of our commitment to customer service, we continue to add programs and services that make it easier for companies to do business with us with things like online ordering and inventory applications.